On 26 October 1942, whilst the bloody Battle of Santa Cruz was raging in the Solomons, another drama was unfolding two hundred miles south. The luxury liner SS President Coolidge, under contract to the U.S. Army as a troopship, steamed toward the safe anchorage of the Segond Channel in Espiritu Santo. 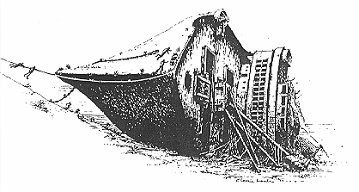 Two mine explosions, laid to discourage enemy attack, mortally crippled the liner. Captain Henry Nelson immediately ran the ship on shore to save as many lives as possible. Within ninety minutes, the 654 ft luxury liner slipped off the coral reef and lay on the seabed, one hundred feet below the surface. Of the 5,000 U.S. infantry and crew aboard, only two were lost. But the demise of the President Coolidge begged a number of serious questions. Did Captain Nelson receive the Special Instructions that would direct him to the safe entrance and thus avoid the deadly minefield? Why was the ship allowed to travel unescorted when it was known that a Japanese submarine was in the region? Was Admiral Halsey covering up for the Navy's mistake? Whatever the answers, the U.S. Army lost a valuable troop carrier in the early stages of the war when it needed all the equipment and facilities possible. More critical however was the stranding of 5,000 fighting men with no equipment and not even a dry pair of shorts. They were on their way to reinforce and relieve the Marines that had taken Guadalcanal only two months previous. How many American lives were lost in the bloody battles of the Solomons because of the lack of badly needed reinforcements? The Lady and President answers these questions and gives a dramatic account of the loss of the ship, subsequent salvage of the propellers and bunker oil, and details of recent day scuba diving on the ‘world's largest accessible shipwreck'. The President Coolidge, once the proud flagship of the Dollar Line and the American President Line, now lies on the seabed in 100 to 240 feet of water. The loss to the allies in the critical first year of the Pacific war was however to become a blessing for the economy of the New Hebrides, later to become the Republic of Vanuatu. Thousands of scuba divers from all over the world travel to ‘Santo' to dive ‘the world's most accessible shipwreck'. She lies on her port side with her bow at only 70 ft, only a short walk and a swim from shore near the town of Luganville. Deep within the ship lies The Lady, a wall fresco that would rate as the most photographed objet d'art under the sea. In the past she would gaze down at the first class passengers relaxing in the Smoking Room. Now she poses for those divers sufficiently experienced to visit her. She is still magnificent. The author has combined the tragedy of war with the pleasure of scuba diving in one magnificent volume. The Lady and the President covers the life and unnecessary loss of a luxury liner that once cruised the Pacific Ocean between San Francisco and ‘the Orient'. Requisitioned in 1941, the President Coolidge was converted to a troopship, and The Lady hid for many decades behind timber hording. Over a half a million US military men and women passed through the huge base at Espiritu Santo during the war years. The Lady and the President covers the establishment of the base, and the construction of five major airfields that contributed to the gradual demise of the Japanese hold on the Pacific. The loss of the destroyer USS Tucker, also to an American mine, is documented in detail. The Military Commission held by the U.S. Navy to prosecute the civilian captain of the President Coolidge reveals surprising evidence. And, at the end of the war, the US forces dumped millions of dollars worth of perfectly good equipment into the sea, creating a monument to the futility of war; Million Dollar Point, less than half a mile from the resting place of the President Coolidge, is a fascinating dive on trucks, bulldozers and cranes. 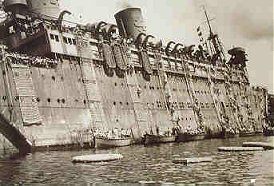 Post-war salvage of the President Coolidge is covered in some detail, with the remarkable salvage of 600 tons of bunker oil transferred to another ocean liner after thirty years in the sea. And for the modern day scuba diver, The Lady and the President describes the most popular dives on the wreck. This is a book for the marine and military enthusiast, and the scuba diver. The author has relied heavily on archival papers, once secret military documents, and the personal recollections of over sixty people involved, in some way, with the President Coolidge. Of prime importance are the personal anecdotes and first-hand accounts of those on board the ship when she hit those fatal mines, the early post-war salvage operators, and the valuable contribution of explorer/ historian Reece Discombe in Port Vila, and the inimitable Allan Power on Espiritu Santo. With over 140 photographs, six maps, and sixteen deck plans and diagrams, The Lady and the President is fascinating and controversial reading, certainly a valuable edition to any library. west coast USA and Asia. Right: As a troopship, mined and aground at Espiritu Santo. The title The Lady and the President is a reference to one of the major attractions to divers who visit the wreck of the President Coolidge, the 'Lady and the Unicorn', a wall decor in the First Class Smoking Room. Chapters include: The establishment of the Dollar Line and the American President Line; the construction and early travels of the President Coolidge; the establishment of Espiritu Santo as a naval and military base; the loss of the ship at the entrance to the Segond Channel; the inquiry and speculations as to to the reasons for her loss; subsequent salvage of the propellors and oil; a description of the ship as she now lies, with special interest to divers; the loss of the destroyer USS Tucker; Million Dollar Point and other local attractions. The book is well illustrated with plans, drawings, and photographs. Author Peter Stone is a writer, publisher and historian who has had a close association with Vanuatu since the early 1980s when operating Aquarius Dive Travel, a Melbourne-based travel agency specialising in scuba diving tours. He has dived the ship, lying in 20 to 70 metres on the edge of the Segond Channel near Luganville, on many occasions over the past fifteen years. His published works include Hostages to Freedom - The Fall of Rabaul, acclaimed as one of the finest war histories produced in Australia; Splendid Isolation - A History of the Yarram and District Health Service; Rabaul's Forgotten Fleet (with Monica Foster); Dive Australia, now in its third edition; Australia's Island Shipwrecks (with Jack Loney), Diving Guide to Australia's South-East and Tasmania, and High and Dry (with Jack Loney). He has written numerous articles for travel, general, sporting and airline magazines, has contributed to several other books, and is an accomplished topside and underwater photographer. The book was prepared with the assistance and encouragement of Port Vila resident Reece Discombe, and Espiritu Santo dive operator Allan Power, with grateful assistance from the Government of the Republic of Vanuatu through their airline Air Vanuatu. The book will be published prior to the end of 1997. Allan Power, has lived in Luganville since 1969, and is renown for his extensive knowledge of the ship. Over the past twenty-eight years he has spent more than one whole year underwater on the ship. New Zealander Reece Discombe, O.B.E. has lived in Port Vila for 50 years and in 1958 discovered La Perouse's ship Astrolabe off Vanikoro. He also has the honour of being awarded the French National Order of Merit, and the British Red Cross Silver Medal. 320 pages with additional eight pages of colour. Contains over 140 mono photographs, sixteen deck plans and charts, and six maps. Overseas postage charged at actual rates.Overseas orders are most welcome. 303 Commercial Road, Yarram, Victoria 3971, Australia.